Enter: Homeschool Programming. When I found out we'd be reviewing their entire Teen Coder series, I was thrilled -- and Connor was ecstatic. 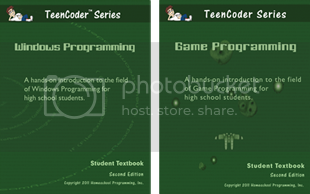 Okay, so the TeenCoder series consists of two "courses" that are each perfect for a one-semester high school course. The first course is Windows programming, the second is Game Programming. Each course consists of two books -- a student textbook, and a Teacher's Edition. The student book is meant to be self-teaching, which was wonderful. The Teacher's Edition contains a SHORT chapter summary, an easy-to-understand explanation of the student project for that chapter, a test and the answers. The Teacher's Edition also contains a disk with pdf files of the chapter tests and loads of help files. The only complaints we really had really didn't directly relate to the course. We struggled to get started as after installing the C# program onto the computer, something happened to it. When we tried to reinstall it, our PC suddenly stopped talking to our network, so we no longer had internet access. Without that bump, Connor would have started the Game Programming course before I had to write this review. The Game Programming Course adds on to the C# programming that your high schooler has learned in Windows Programming, and includes the use of Microsoft's XNA Game Studio. The Game Programmer course has fifteen lessons which culminate with the creation of a bumper cars game. According to the website, learning the XNA Framework will also allow the student to program games for the Xbox 360 with a little extra effort. I haven't told Connor that part yet. If you aren't quite to high school yet, they also have a Kid Coder series which uses Visual Basic instead of C#. This is also split into two courses, Windows Programming and Game Programming. Teen Coder can be ordered for $75 per level, or $130 for the entire year. Note: The Crew received the first edition for review. Since that time, a new version has been made available for sale. This 2nd Edition is easier to get started with and did replace some of the projects. (I wonder if the easier start-up would have fixed our initial installation bumps?) However, the course I reviewed is substantially the same as the one you can now purchase. 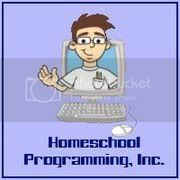 Disclaimer: As part of the TOS Homeschool Review Crew, I did receive the Teen Coder series from Homeschool Programming. The fact that I received complimentary products does not guarantee a favorable review. It does guarantee a review. A fair review. But I am not going to praise something unless I think it deserves the praise. If I don't like it, you'll hear that. And hopefully with enough detail as to why so you can decide for yourself if what I hate about it makes it perfect for your family. For more about my take on reviews, visit my blog post here. Gregory had some c# in college and Timothy is learning it right now in our home school. He is teaching himself from several different resources. Greg was over on the weekend and they had a great time talking programming. I will keep this resource in the back of my mind should it seem we need it. Thanks for the review.